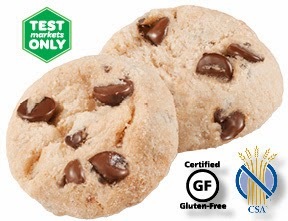 My friend Tina sent me an article the other day about the Girl Scouts testing out a new gluten free cookie. The cookie will only be available in select markets and is described as a "chocolate chip shortbread cookie" and is made of rice and tapioca flours. The cookies contain "no artificial flavors, no artificial colors, no high fructose corn syrup, no palm oil, and no hydrogenated oils" according to the Girl Scouts' website. Want to see if you live in a test market? Click here to check out the list of testing places. Sadly neither San Diego or Los Angeles is included in the list but Orange County is... so perhaps a road trip is in order?